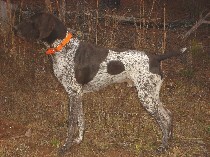 I have a 5 month old GSP who I was originally training to be a service up until a month ago. During the time from 2 months until 4 months, loose leash walking was fine then it progressed from a 20 minute straight walk to 1hr and 10 mins. I'm guessing his energy level increased. He also stopped playing fetch, common, took toys away and gave when time needed. I called the vet and spoke about LIGHT jogs and that was a go. That was working until he discovered birds and what turned good for him was ehhh a struggle for me. I started waking up before sunrise to walk him, walked him after dusk, continued trying to get him interested in other toys, along with jogs and time in an open field. Still wasn't enough. Pounding my head on wall (not literally) and getting frustrated, I didn't know what to do. One day I took him for a walk and I noticed what I did think is the final sensory (smelling the air maybe to catch a scent riding the wind) to tell if you are going to have a good bird dog and it hit me. I'm training him to be the wrong dog. I would read this forum before I joined recently to see what others do for basic obedience, house problems, ways to blow of energy and other training methods and I was missing the big picture. I took him on a short hiking trail that lead to a river for I guess what's called terrain exposure and it was a side of my pup I've never seen before. Freedom. I'm a big guy and it was a little emotional to see that I was wanting him to be a service dog and then seeing his true nature come to life. Since that moment, we've been out to all different types of terrains with no commands, he's happy, it's therapeutic for me and I'm enrolled In a hunters safety course because I'm from a place where they don't really do these type of things y'all talk about in this forum. He's caught a dove and I didn't know what to do but praise him on the outside and panic on the inside because he mouthed on it a few times. I sat him down after he came to me and I gently pried his mouth open and took the dead dove out.I have the (Best way to train your gundog by Delmar Smith) which apparently is the Bible to all of this, on the way. Now that I've painted a picture, in respects to what I've read online and through here, is there any feedback this forum might be able to give to me for my pup and myself? Anything helps and would be much appreciated. Hardtops Up... Softtops Down... Brothers for life. I wouldn't give up on training retrieves. I am not always able to take a dog out and hunt it over "gamey ground" but I can always find places to take dogs for retrieves. Doing retrieves can help with a dogs focus on you and long retrieves, done as memory retrieves, can give a dog a lot of exercise and mental stimulation without you always having to walk miles. I have no idea what type of things we talk about here that you don't have in your area but I think you'd be wise to find some other bird dog folks. Look at sportmens/game clubs, GSP or other pointing breed clubs (look on AKC site for those), different trialing or testing venues like NAVHDA, NSTRA, UFTCA, AKC trials or hunt tests, American Field trials, local bird dog trainers, etc. Then you can attend some events and see what floats your boat. You'll make contacts to maybe dind a training group or buddy. Best of luck to you. Your dog is lucky to have an owner that knows what shape peg fits into what shaped holes. Will your dog play tug of war? Tug of war is a no no! For a lot of dog's it teach's hard mouth and not returning all the way in with the object. I think you said your pup was 5mos old, give it time and it will probably come around. Don he never stated he was going to hunt this dog. He stated he's enrolled in hunter safety. He also stated he's used other toys to try and spark interest. If he's just going to use the dog as a pet tug of war is a good way to spark interest for fetch. I personally think he should home this pup in a hunting home and get a dog he can use for service. But that's my opinion, I don't know if that's even an option for Gsp fng. Folks, I am greatly appreciative and sorry for not responding to your post replies. I though responses would've been notified through my email and weren't. I've struggled navigating through this forum and have somewhat figured it out. I'd like to again thank each individual person for their responses. Don: The reason being for training him as a service dog is because I'm a veteran with a service-connected disability. Although not realizing this breeds drive to hunt, his other characteristic traits and abilities led me to believe that it would be a good suit. Since having him, he's gotten me to do things that I wasn't able to do on my own i.e. creating a structured environment, regaining discipline to a certain degree, exercising, forced to get out of bed, watching my output of negative energy and then some. Your input, although not of been able it use it, was very precise and interesting. I feel it is a beneficial piece of information and I look forward to applying it. Thank you for your input on tug of war. Trekmoor: I gave up on retrieves but not fully. My wife was actually the one who got him to do it along with catching a ball in the air. " It takes a child's hand to bring a pup from nest, a woman's hand to bring him along, and a man's hand to bring him about" -Delmar Smith-. He's very driven for fetching, not a bad thing but drives me nuts. Shags: Thank you for your input on finding different local clubs and for your sincere compliment. Shellotame: He has no desire for tug of war and is just strictly on a fetching rampage. It's literally non-stop. I do plan on hunting him now for the base I live on has an enormous amount of land for both hunting a wide variety of game and excellent terrain exposure. Bob: Thank you for your training schedule input and have already implemented one and he has quite benefited from it.